This week, Katherine has been working on Patrick's quilt and also Brooke H's quilt, Poppy's quilt and Rhea's quilt are all in progress. 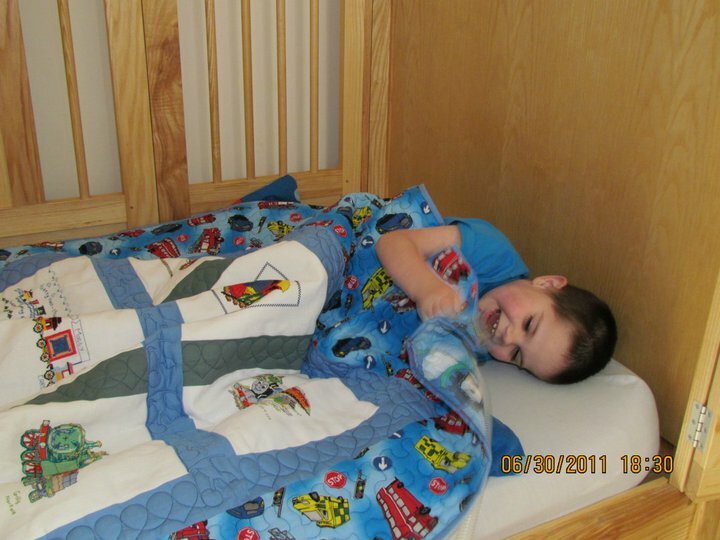 Daniel C's quilt was opened and closed. Iona's quilt was opened and closed. Jennifer M's quilt was closed. We have received a tremendous 55 squares since our last update, 10 days ago! Many thanks to all those who stitched them! (See Fabric page for details) Thank you very much for your support! We now have many, many duvet covers to use for backing - thank you to all for your support! Big thanks to Joy, Joyce and Melanie respectively for quilting these lovely quilts and to all the wonderful stitchers who have contributed! 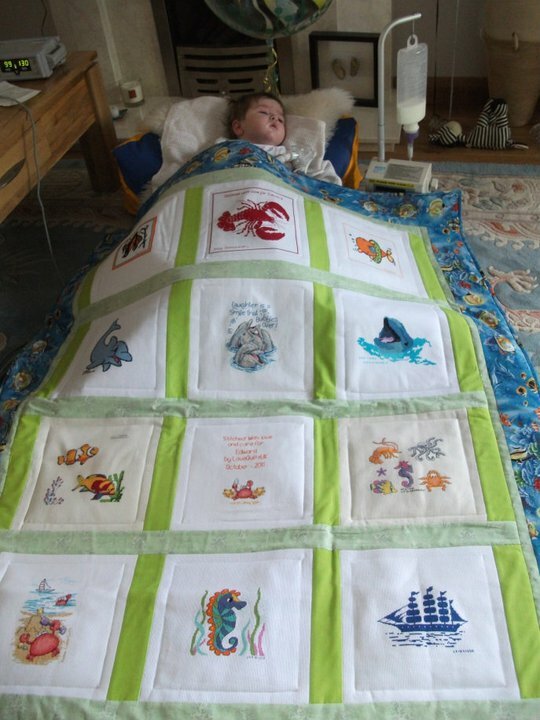 Matty's mum has sent the following message: "I was wondering if the ladies who made Matty's very special quilt could leave a little massage about them selves on Matty's website. His site gets made into a book for him to read and it would be wonderful to have a little knowledge of the ladies who took the time to do something so special for him." We have received 31 squares since our last update! Many thanks to all those who stitched them! The manageress of a British Red Cross Shop has very kindly donated a large quantities of Aida and threads to our stitcher Pascale. These will be used for Pascale to make up cross stitch squares for us and we are really appreciative of the support. We recently received another large consignment of stamps - thank you to the anonymous benefactor! Also thanks to those who have sent cash/Paypal/cheque donations in - it is really appreciated. There is lots of quilt news to report! Faith's quilt has been delivered. Many thanks to all the stitchers and to our new quilter Liz and her family members who assembled it! 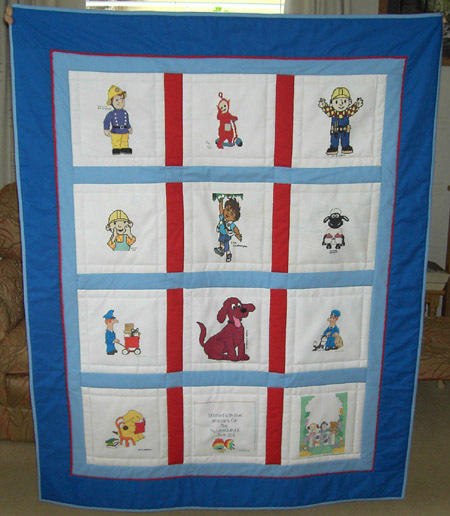 We have also had word that Matty H (Trains), Jack B (Soft animals) and Max P (CBeebies characters/vehicles) quilts have been completed by quilters Melanie, Joy and Joyce respectively, and they are now in the post. Look out for news on them next week. Rhea's quilt is also under construction and next on the list is Poppy's quilt (pink theme) which Katherine and Gaynor are currently sorting out. We received news this week that Edward Y was extremely poorly, so Katherine and Gaynor decided to elevate his quilt to Emergency status. Fortunately, we already had 9 squares in and we made up the last 3 from our Any Child stash. Our quilter Anna very kindly worked extremely hard to make up the quilt quickly and Edward's quilt was delivered just five days later. Special thanks to Anna for her efforts, Katherine for organising the squares and fabric at short notice and also to Pascale who rushed her two squares directly to Anna for us. 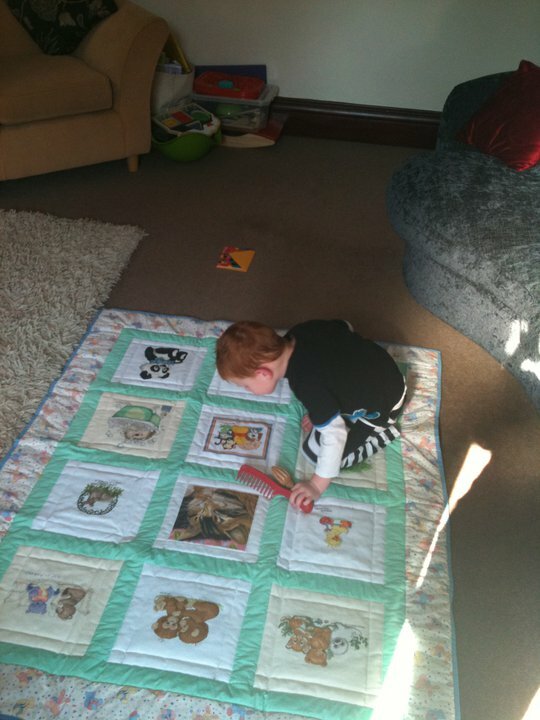 Edward is now at home, but he is still very poorly. 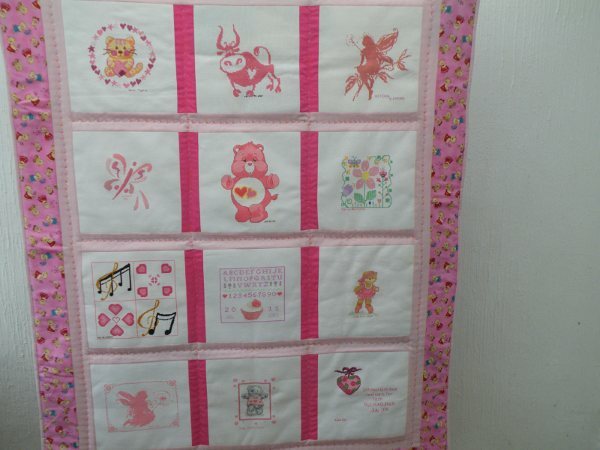 Many thanks to ALL the stitchers who have contributed towards this quilt. Since the last news update two weeks ago, we have received 41 squares! It is amazing how many squares are flooding in now - thanks so much to all of you, and also to Katherine who spends so many hours photographing them and uploading them to the website for us. Also thanks to those who have sent donations via cash/cheque/Paypal this week. You know who you are and it is really appreciated, we have said it before, but we really couldn't keep going without cash to cover postage for quilts and to buy coordinating fabrics, threads, wadding etc. Thanks again.